We constantly see business owners try the same marketing tactics over and over again; wasting more money, more time, and more energy. If we had 1/10th of what business owners waste on stuff that doesn’t work, we’d be the most successful marketing agency on the planet. Many business owners would rather go at it alone and fail over and over again, than reach out and get professional help. That’s why we are here to help. Guessing – Great marketing isn’t an accident. It takes research, educated decisions, testing, tracking and measuring. Guesswork will leave you customer-less and broke. Doing what everyone else is doing – Every business is different and your marketing mix should be too. Following the crowd isn’t going to help you stand out from the competition! Listening to sales people – Marketing is a long term strategy, not special advertising, publication, or website; but every sales rep you come in contact with will try to convince you otherwise. Marketing is a process, there is no magic pill and don’t let a slick sales person try to tell you there is! Not asking questions – Question EVERYTHING about your business and ask everyone you come into contact with as many questions as possible to learn, grow, and constantly improve. Assuming you have all the answers – Yes, we know: you know your business better than anyone. But do you know marketing? Do you REALLY know how and where to reach potential customers and convince them to buy from you? Ignoring your competition – If you don’t know how you’re different from your competition how are potential customers supposed to? Knowing your competition’s strengths and weaknesses will help you differentiate. Not setting goals – Goals keep us on track; they give us direction. Without them you’re wandering aimlessly and most likely wasting a lot of time and money. Not building an email list – We don’t understand how anyone can market a business in today’s world without an email list! Email is the easiest and most inexpensive way to stay in touch with customers and prospects. If you aren’t building a list you’re missing out on huge opportunities. Not having an opt in form – Emailing customers is a great start, but what about the people who visit your website, Facebook, Twitter, or LinkedIn pages and then go away never to be heard from again? Wouldn’t’ it be nice to engage the serious window shoppers in some way? An opt-in form is the way to do it! Selling all the time – We’ve all met the slick schmoozy salesy types, right? And how long does it take you to high-tail it in the opposite direction? Don’t be one of those. An effective marketing strategy eliminates the need to sell all the time… really! Assuming that just because you have a good product or service you don’t need a referral system – Again, there are some products and services that people just love to talk about, but building a successful business solely on organic referrals and “buzz” is rare. Getting solid referrals, consistently takes planning and solid execution. . Assuming anyone with a pulse is a potential client – Repeat after me: “NOT everyone is a potential client for me”. Now look in the mirror and repeat that every day! Find your niche – that segment of the population you are born to serve and you will uncover a gold mine! Not building relationships – We can’t stress enough how important this is. Hiding behind your computer screen, desk, or counter isn’t going to get you the level of success you want. You have to get out there – mingle, be helpful, connect people, and build relationships with the right people! Networking in all the wrong places –Not every networking group is right for you. Find the ones that will help you get where you want to go and avoid the ones that won’t. Not hiring a professional – If you want to build an addition onto your home would you do it yourself or hire a professional? You know your home better than anyone, so why not do it yourself? Ridiculous, right? So then why would you try to “add on” – or grow – your business yourself? Hire a professional who has the right tools, experience, and expertise to make your business grow! 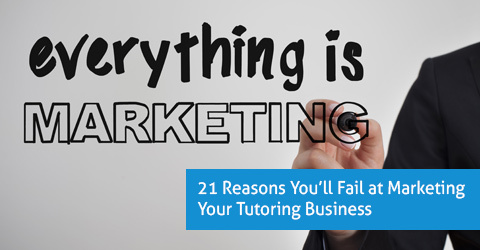 And, a bonus tip: Oases Online is dedicated to helping your tutoring business grow. Connect with us and we’ll walk through what our service is all about, and how we can help you be successful in your marketing efforts.